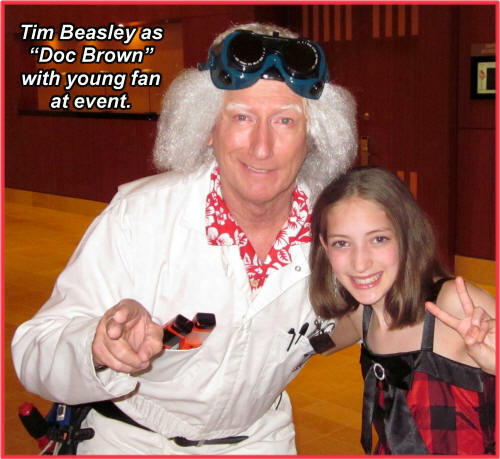 Tim Beasley portrays "Doc Brown," the lovable time-traveling inventor genius and central character from the 3 wildly popular "Back To The Future" movies, in an full-dimensional impersonation of the role made famous by actor Christopher Lloyd. 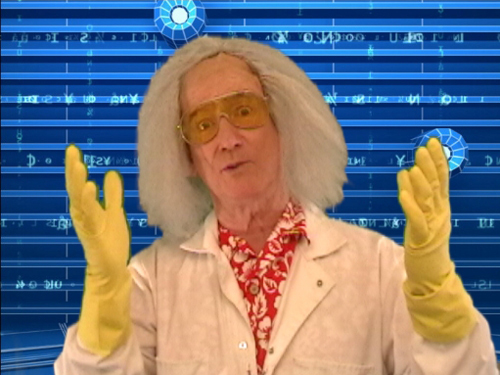 As one of the most successful film series of all time, the movies and characters have many millions of fans world wide. 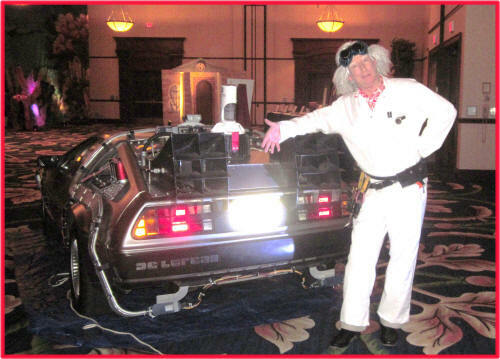 With such a fan base there is plenty of special occasions where a "Back To The Future" theme event will be a definite winner with any group or audience. 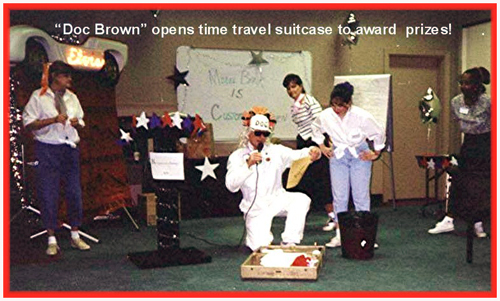 Recreating the role of "Doc Brown" professionally is a fun "blast from the past" where Tim as "Doc" can meet & greet attendees, with paparazzi-photo posing fun, emcee the "future" with audience participation and interactions, conduct the door prizes and award ceremonies with just enough time-traveling zip and zaniness to keep the event "right on time!" 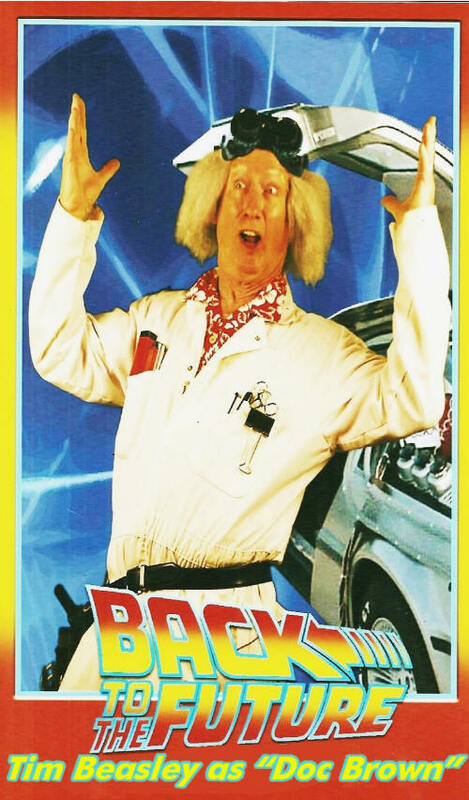 And consider having "Doc Brown's Time Machine DeLorean" also there to draw the crowds and generate that "1.21 Gigawatts" of attention getting power!!! 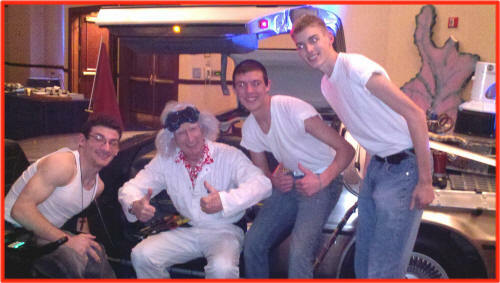 Three young fans doing it 50's style havi ng "Time Machine photo fun with Doc Brown"
"Doc Brown" is also perfect for corporate events focusing on the "future" goals of a sales campaign, such as a "Our Future Depends on Teamwork" rally, or maybe an entertaining time-traveling tribute to a business anniversary like "University Mall Celebrates 30 Years With Prices Back To The 70's!" 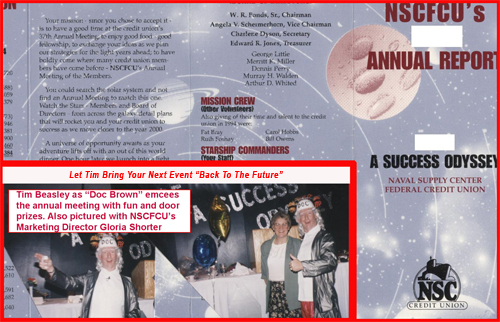 or even as simple as a special person fan celebrating their birthday, graduation or other special occasion. 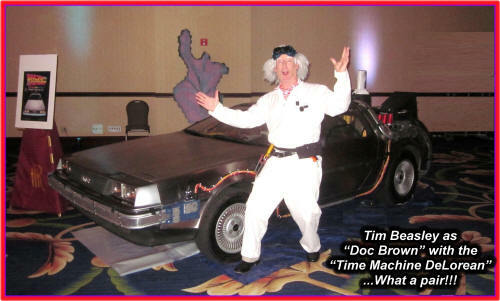 Previous events include emcee for Nations Bank's "Back To The Future"
Book Tim now as time is ticking toward your next special event!